Artificial boxwood and faux plant walls have all the beauty and benefits of their live cousins without ongoing work or worries after installation. Shop online sizes or call to buy custom wall panels. Perfect for covering unattractive features such as air conditioners or accent walls that might otherwise appear bland, boring or unattractive. Add grace to condo and apartment complexes, offices, stores, commercial buildings, schools, arts venues and public spaces. Plant varieties include artificial ivy walls and fake boxwood walls, as well as flower walls of azaleas and cypress/arborvitae types. Boxwood is slow-growing and requires constant maintenance, but our realistic fake boxwood walls are thick and look like they've been growing for years. No watering, no maintenance - ever! 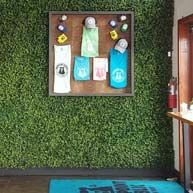 All of our outdoor artificial plant walls and lettering products are made inherently UV resistant to maintain their vivid green. Unlike coated UV treatment post manufacturing, our method ensures many years of protection and beauty while the competition fades and degrades. Our foliage showed NO visible color loss after a year of UV exposure equivalent to that of Miami Florida. They also enhance LEED ratings because they eliminate water and energy use. Designers, architects and owners often assume adding green walls will be expensive, increase the likelihood of water damage and require extensive maintenance. All of those may be true, making artificial options a great alternative. Ivy vines create a great look and are an enduring favorite, but can be invasive and damage building surfaces. 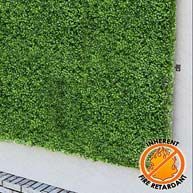 Artificial ivy tiles ensure your vines grow only where you want them, rather than covering windows or other features that require frequent trimming. Our boxwood options instantly provide this desirable, but slow-growing plant in mats. Create a wonderful screen for anything from air conditioners or utility boxes to separate outdoor living spaces for condos, apartments, restaurants, or in any commercial or public setting. We use only top grade, realistic plants for our products, attaching them to the frame with matching green twist ties and steel "hog-rings". 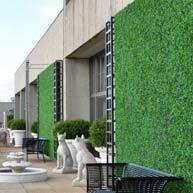 Ivy and boxwood walls come in standard sizes, or we will craft walls to your custom dimensions. Besides looking amazingly real, our faux foliage has top UV resistance for each branch and leaf manufactured, rather than short-lived sprayed-on post manufacture UV coatings that last only a short time outdoors before fading, browning or rinsing off from sprinklers and rain. Do you dream of living in a lush garden space? Surrounding yourself with greenery can be calming, but maintaining a sumptuous green area can quickly turn into a nightmare. Artificial living walls are the perfect combination of luxurious living without the stress of maintaining a perfect green space. Bring greenery into unusual places and add impeccable taste to many areas of your home. 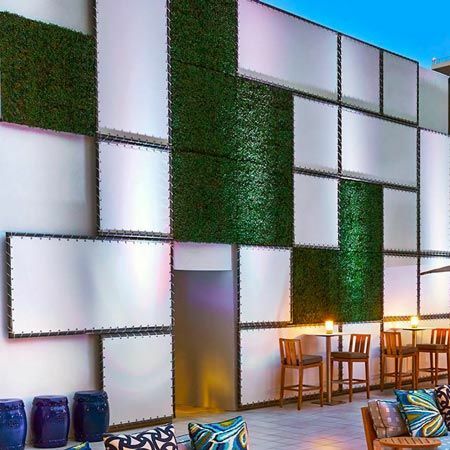 The traditional living wall comes in squares in a variety of sizes that can be pieced together or used separately. Offering a touch of nature to urban environments in addition to privacy and sound absorption, a living wall placed on a shared wall can block out the sights and sounds of a neighbor while covering unsightly wall spaces. Available in boxwood or traditional ivy these products feature fire retardant and UV resistant chemicals to keep it looking fresher longer, giving you a flawless look year round. Available in a variety of sizes, faux foliage frames are great for home exteriors or commercial areas. 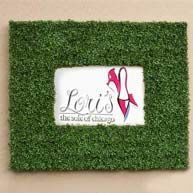 The frames, such as this outdoor artificial boxwood frame, look great on their own or with a large picture or sign inside. Hedge frames are open to creativity - place a restaurant menu or a flat screen TV inside for a truly unique and luxurious look. Each ornamental boxwood hedge frame features the natural texture of the real plant, but made with a strong, UV protected material. For more options or to cover a larger space, turn to rolls of artificial plants. 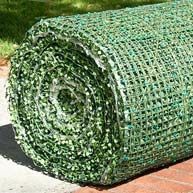 These rolls are available in a variety of plant types and can be used as groundcover or to cover a large area of wall space. This azalea roll comes in three colors and can be easily installed in a variety of places and trimmed to fit the exact space. Rolled artificial hedges let your creativity bloom without sacrificing style, quality, or ease. No matter their shape or size, living walls are a simple way to add a touch of luxury to any space. The lifelike plants can turn any area into an oasis and the green area of your dreams. Living Wall Letters add yet another distinctive green wall element outside your business. Made as plush artificial boxwood lettering, flowering azalea, or sumptuous English Ivy foliage, these green topiary letters provide more than green space. They also increase modern corporate branding capability. Spell out your company name, logo, or a directional message for a truly unique application. Fire retardant and UV protected, giant topiary letters are perfect when placed at building entrances, restaurants or hotels, even city hall. They are maintenance free and spruce up dull building exteriors while increasing a sense of peaceful green living in an oh-so-Eco-friendly way. Custom panels can be arranged in a wide variety of ways. Using freeform green panels allows you to style in a manner consistent with your exterior design scheme and architecture. Use as 3D wall art to hide unsightly aspects of a wall, or even to cover electrical panels and other problem areas. 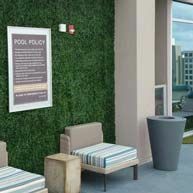 Freeform green wall applications provide the same lush coverage with faux boxwood, elegant English Ivy or flowering azalea material to convey an eco-friendly motif for your business. Set as a unique focal point or backdrop on plain concrete walls or create patterns for a distinctive artistic effect.